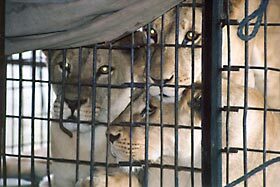 Frequent and long periods of travel in trailers are the norm for animals in circuses. During a performance season circuses typically visit many different cities all over the country, covering thousands of miles and staying at each site just a few days. The animals must endure this continuous travel and unstable environment for their entire lives. “Although some horses adapt to transport much better than others, transport is generally associated with lower reproductive rates, increased disease incidence, a temporary reduction in athletic performance and the alteration of many other physiological traits that are indicative of stress….Transported horses can be subjected to a wide range of potential stressors, including isolation from herd-mates, forced close proximity to unfamiliar or aggressive horses, novel or threatening surroundings, exposure to new pathogens, restraint of normal activity patterns, forced adoption of an abnormal posture, extremes in temperature, water and feed deprivation, and blowing dust and particulate matter. Transport has long been associated with morbidity in horses” (Friend, 2001). These problems occur across a wide range of species for varied durations and conditions of transport and are a key factor in traveling circus life, a serious welfare problem for animals. Alpacas, members of the camel family, who traveled for just 30 minutes, suffered from a resulting potentially dangerous hormone disorder called hypercortisolemia (Cushing’s syndrome). When the trip ended at a location familiar to the alpacas it still took four hours for their cortisol hormone levels to return to normal (Anderson et al., 1999). Circus animals are often transported for longer periods and, unlike the alpacas, transported to unfamiliar locations. Tigers in circuses show a wide range of abnormal behaviors and coping strategies while traveling. One of the most common stereotypic behaviors is pacing. In one study pacing increased as travel time increased (Nevil and Friend, 2003 and ADI data). A study of captive black rhinoceroses demonstrated a connection between transport and the immediate development of a skin disease (Munson et al., 1998). Many species are known to suffer from “capture myopathy,” a syndrome that occurs in wild mammals and birds, whether free-ranging or captive, associated with the stress of capture, restraint and transportation. In many animals the syndrome is characterized by clinical depression, muscular stiffness, lack of coordination, paralysis, metabolic acidosis and death (Montanè, 2002). ADI has videotaped stereotypic behaviors in almost all circus animal species, including horses, ponies, llamas, camels, giraffes, elephants, lions, tigers and bears. There are numerous studies on the effects of transportation on horses and other animals used in agriculture; this data also applies to animals in traveling circuses. “Horses brace themselves against and in anticipation of the changes in momentum during road transport by adopting certain body postures (notably the base wide stance). Efforts expended by horses as they continually adjust their posture during transit reflect both muscular and emotional stress related to road conditions and the drivers’ behavior. All of these efforts are readily evaluated by monitoring heart rates during transport. Horses have been shown to have higher heart rates in a moving vehicle than in a stationary vehicle, and although heart rates decreased significantly during a road journey, they did not return to resting levels. Transport stress may increase susceptibility to diseases, including an equine herpes virus and salmonellosis infections”. A study of the effects of a 24-hour transport in horses showed that “Plasma cortisol concentration increased during loading and the first 3 hours of transport and continued to rise throughout the 24 hours, to peak at the termination of transport… after the stressor (i.e., transportation) ceased, cortisol dramatically declined” (Stull and Rodiek, 2000). Many studies show that transport induces weight loss in some animals. Immediately following transit in one study by Stull and Rodiek (2000), horses showed a 6 percent weight loss. The investigators thought this could be due to “heat dissipation, sweat loss, and decreased gut fill during transit,” but there was still a 3 percent weight loss 24 hours after the transportation period. Aggression among horses increases during transportation, especially when many horses are transported together (Collins et al., 2000). About 20 percent of all horses receive some type of injury during transportation, most of which occurs to the head and face (Stull (1999) in Speer et al., 2001). Another paper reports “many incidences of aggressive horses repeatedly biting an adjacent horse in an apparent effort to get the horse to move away” (Collins et al., 2000). ADI has recorded evidence of aggression in horses during transport and in stable tents. Some animals that are considered to be difficult, or potentially aggressive, like stallions, are not allowed into enclosures, and therefore miss their turn to exercise. Transport is thought to be one of the most potent stressors for cattle (Fazio et al., 2005). Stressors involved in the transportation of cattle result in altered nutritional status and animal behavior, reduced body weight gain, feed consumption, immune disfunction and increased mortality (Coffey, 2001). Long-term transportation in cattle has been found to increase the secretion of ACTH (adrenocorticotropin hormone), a regulator of immune responsiveness, and therefore to exert a negative effect on the immune system. When cattle are fed on their stationary transporter their ACTH levels remain high, coming down only when they are removed from their truck and rested and fed in stalls for 24 hours (Dixit et al., 2001). Transport stress induces an increase in thyroid and adrenal activity in cattle that is evident even after a short trip and continues to increase after long-distance transport (Fazio et al., 2005). Studies have also found that long-term transportation in cattle results in an increase in heart rate and body temperature (Dixit et al., 2001). Transport compromises the welfare of sheep. Some studies have found experiences associated with loading to be particularly stressful. There was an increase in the core temperature of sheep after two and a half hours of road transport (Parrot et al., 1999). Sheep showed heart rate and cortisol increases in response to transport (Baldock and Sibly, 1990.; Cockram et al., 1996.; Hall and Bradshaw, 1998). Pregnant horses transported for nine hours showed signs of prolonged stress associated with abortion or reabsorption of early pregnancies, signaled by a change in the concentration of ascorbic acid in plasma and tissue (Baucus et al., 1990a). The study also showed that transportation caused increases in serum progesterone and cortisol, also indicators of stress. Thirty mares were tested daily throughout one normal estrous cycle. There was an increase in LH concentrations in transported mares (LH stands for luteinizing hormone, which regulates the release of progesterone and estrogen) and an increase in cortisol and plasma ascorbic acid. The paper concludes that the 12-hour transportation of mares induces “hormonal and plasma ascorbic acid responses indicative of stress” (Baucus et al., 1990b). While it is a common view that horses and other animals become accustomed to transport, we have not seen any scientific evidence of this. In ADI’s view, the fact that an animal undergoes an experience repeatedly does not make the experience less traumatic. It may in fact make the animal more sensitive to the trauma. Many of the reference papers we have reviewed describe the effects of a single journey, but since circus animals must endure multiple and frequent journeys, at least some of these effects will be multiplied.